Spatial Directions first built project in Tasmania is taking shape in Austins Ferry. The clients are excited to see the results of a collaborative design process taking shape. Working from a well developed initial plan concept provided by the clients, Spatial Directions optimised the layout for solar access and views, trialled different appearances in roof form and materials- presented in 3 dimensions to the clients. The builder, Cre8tive Constructions, has risen to the challenge of building on the fairly steep site. The house is a spacious 4 bedroom, 2 storey residence taking advantage of panoramic views over the Derwent River on a corner site. 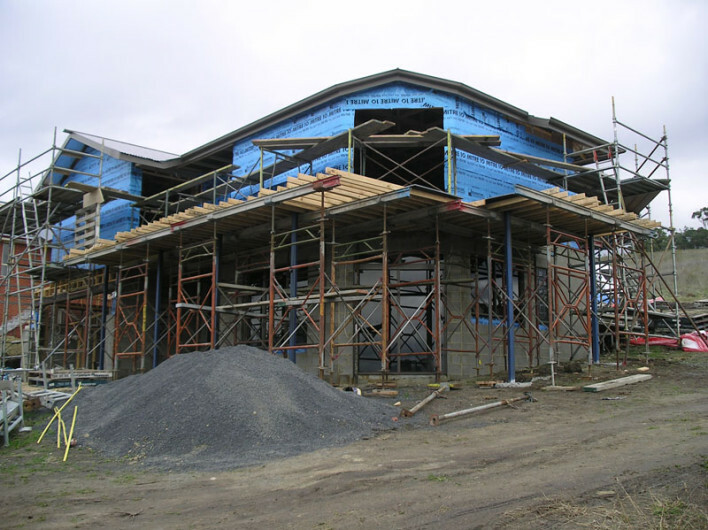 Construction is rendered masonry veneer, Colorbond roof and aluminium windows. Stay tuned for pictures of the final building due for completion in the coming months.